Andre Farkas, founder of Viaje Cigars has been using Facebook quite a bit to start to give folks a feel for what his next small batch shipment of cigars will be. In this case, a picture is not going to be quite be a 1000 words, but it is enough information where we can get a feel for what is coming. The caption under the Facebook post said, “We received a few tag alongs with the 12 Gauge shipment. BE WARNED!” The 12 Gauge shipment refers to the second vitola of the Viaje Super Shot. About two weeks ago, Viaje retailers started receiving the first vitola, the 10 Gauge. We do know the 12 Gauge is a slight smaller vitola than the 10 Gauge -as this new vitola comes in at 3 1/4 x 52. The other component to this shipment appears to be some new additions to the popular Skull and Bones series. 1.WMD (Weapon Mass Destruction) – This is a part of the “red label” blend. This vitola was part of the third batch of Skull and Bones that was released last year (first featuring the red label blend). When this was released last year, it was a 3 3/4 x 54. *Update 3/17/12: From our reader comment below (thank you for bringing this our attention) and further examination, we believe the size of the WMD is smaller. The folks at halfwheel are reporting this to be a 3 3/4 x 52, and we believe their information is accurate. 2.MOAB (Mother of all Bombs) – This was also a part of the third batch of Skull and Bones released last fall. In this post, Farkas points out that this is a “White Label” blend (featured on the first and second batches of Skull and Bones). Last year this was a torpedo, and this is time it is a 4 1/2 x 54 short robusto – very similar to the second iteration of the Skull and Bones. 3.FOAB (Father of all Bombs) – This is a play on MOAB. This appears to be a new addition to the series (right box). This is slightly larger than the MOAB at 4 1/2 x 56 (also a small robusto. Here is a picture prior to release put up on Facebook of the Vitola. Farkas’ post says the shipments are scheduled to go out later this week (from publication of this post) to authorized Viaje retailers. This shipment will also include the Viaje White Label Project Candela 2012. We will have more information as it is released. 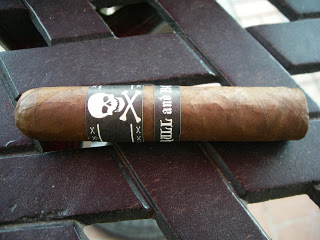 I've seen the Viaje Skull & Bones Red WMD 2012 as having a 52 ring, not the original's 54 ring as you post here. Which is correct? Thanks for that feedback. Based on your input I've looked and do not believe the 52 ring gauge is correct for two reasons: 1) I held it up to the Super Shot 12 Gauge (which is a 52 ring) and the WMD 2012 was definitely bigger; 2) Every retailer who has the WMD 2012 listed has it at 54. Unfortunately I do not have a WMD 2011 to compare it against. I'll keep an eye out for this and if I can get some confirmation one way or another, I'll update accordingly. And now I put it next to another 54 ring gauge, and it is smaller. There may be something to this. Thanks for the input.